A common treatment strategy for pediatric attention deficit/hyperactivity disorder (ADHD) and major depressive disorder (MDD) is combined methylphenidate (MPH) and fluoxetine (FLX). This has raised concerns because MPH + FLX treatment may have pharmacodynamic properties similar to cocaine, potentially increasing drug abuse liability. To examine the short- and long-term consequences of repeated vehicle, MPH, FLX, MPH + FLX, and cocaine treatment on gene expression in juvenile (postnatal days [PD] 20–34) and adult (PD 70–84) male mice. We further assessed whether juvenile drug treatment influenced subsequent sensitivity for nicotine in adulthood. Juvenile and adult C57BL/6J mice received vehicle, MPH, FLX, MPH + FLX, or cocaine twice-daily for 15 consecutive days. Mice were sacrificed 24 h or 2 months after the last drug injection to assess drug-induced effects on the extracellular signal-regulated protein kinase-1/2 (ERK) pathway within the ventral tegmental area. 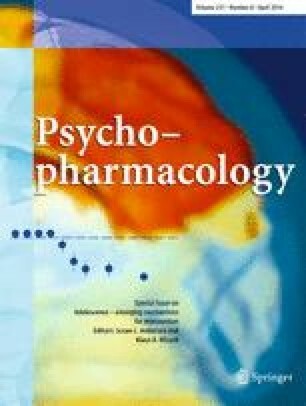 Subsequent sensitivity for nicotine (0.05, 0.07, and 0.09 mg/kg) was measured using the place-conditioning paradigm (CPP) 24 h and 2 months after juvenile drug exposure. MPH + FLX, or cocaine exposure in juvenile mice increased mRNA expression of ERK2 and its downstream targets (CREB, cFos, and Zif268), and increased protein phosphorylation of ERK2 and CREB 2 months after drug exposure. Similar mRNA findings were observed in the adult-treated mice. Findings on gene expression 24 h following drug treatment were variable. Juvenile drug exposure increased preference for nicotine when tested in adulthood. Early-life MPH + FLX, or cocaine exposure similarly disrupts the ERK pathway, a signaling cascade implicated in motivation and mood regulation, and increases sensitivity for nicotine in adulthood. This work was supported by R01DA026854 from the National Institute on Drug Abuse (NIDA). LF Alcantara was supported by a McKnight Fellowship from the Florida Education Fund, BL Warren by training grant T32MH093311 from the National Institute of Mental Health (NIMH), and SD Iñiguez by a NRSA F31027300 fellowship from NIDA.